Central Carolina Community College Barbering student Adrian Thomas (standing), of Harnett County, lathers up a fellow student during the Harnett County Campus' April 8 vocational programs tour for Harnett County Schools eighth grade students. 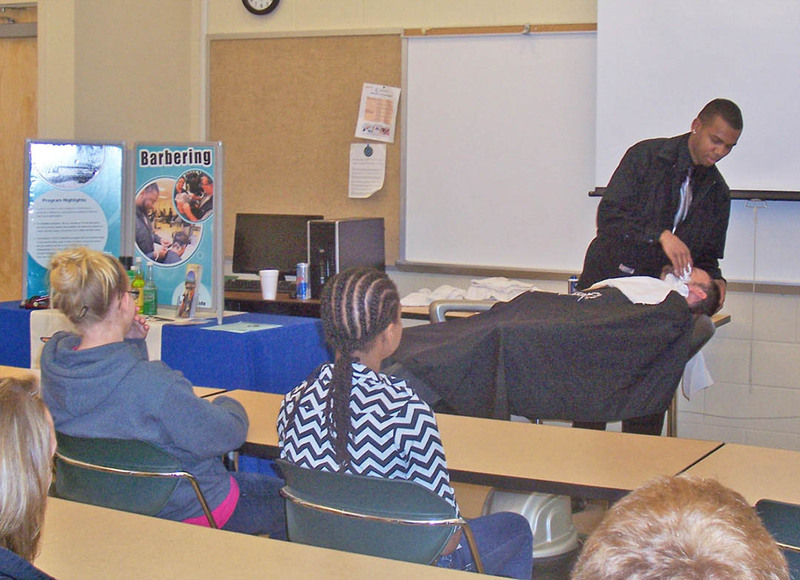 Barbering was one of a number of programs that put on demonstrations and provided information to the visiting students to give them an idea of the many career fields that are available and the types of training the college offers. Every eighth grader in the county visited the campus this school year. The college offers these tours annually for the students to receive an overview of the college and to see programs such as Laser and Photonics, Computer Aided Machining, Dental Assisting, Cosmetology, Barbering, Medical Assisting, Certified Nursing Assistant, Phlebotomy, and Telecommunications. The eighth graders also hear about the Career and College Promise program, which will enable them to take college courses for free in high school. The Harnett County Business Partnership assisted with the tours. The goal of the partnership is to have every student make responsible career choices and manage the challenges of a rapidly changing workplace. For more information about CCCC's programs, visit www.cccc.edu.